Roughly three quarters of the stars in the galaxy are reddwarfs, but planet searches have typically passed over these tiny faint starsbecause they were thought to be unfriendly to potential life forms. But this prejudice has softened lately. Preliminary resultsfrom a dedicated research program have shown that planetsaround red dwarfs could be habitable if they can maintain a magnetic fieldfor a few billion years. Red dwarfs — alsocalled M dwarfs — are between 7 and 60 percent as massive as our sun. ?Theirlower mass means they don?t burn as hot or as brightly, emitting less than 5percent as much light as the sun. However, they have strong magnetic activity,which makes them relatively bright in X-rays and UV radiation and causes themto flare frequently. To understand the environment around these common stars, the"Living with a Red Dwarf" program was started three years ago. It ispiecing together observational data to provide a profile of how red dwarfs varyin brightness and magnetic activity as they age. "This is the information that you would want to know tomodel the suitability for life on a nearby planet," says Ed Guinan ofVillanova University, a scientist working with the program. As habitability goes, red dwarfs were thought to be the badroommates of the cosmos. Because they are so faint, the habitable zone — the distancefrom a star where liquid water can exist — is in many cases closer than theorbital distance between Mercury and our sun. When a planet orbits a star thisclosely, the gravitational pull of the star may cause the planet to become tidallylocked with the same side always facing the star (similar to the Moon's fixedgaze on the Earth). 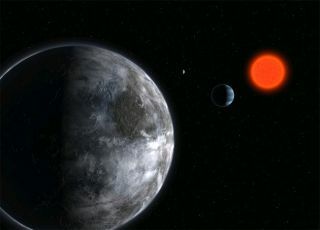 Previously, scientists speculated that the dark side of atidally locked planet would become so cold that it would freeze up the entireatmosphere, leaving even the sun-lit side with little air for breathing. Butmore recent models have shown that winds would distribute the heat sufficientlyto avoid this atmospheric collapse. Still, life might not be a picnic around a red dwarf. Severaltimes per day flares shoot off the star, causing the UV radiation to jump by100 to 10,000 times normal. For several minutes, the star appears blue insteadof red. This increased radiation could sterilize the surface of a nearbyplanet. "You probably want to live on the dark side,"Guinan says. "Or at least along the twilight zone where you would haveless exposure."? Even between flares, the combination of UV light and stellarwinds can stripaway the atmosphere if nothing is protecting or replenishing it.? However, all hope is not lost. The high-energy radiation is predominantlyemitted by young stars. As they age, red dwarfs become less magnetically active,while continuing to shine steadily at visible wavelengths for 100 billion yearsor more. Therefore, if an orbiting planet can just hold onto itsatmosphere through the wild early years of its red dwarf roommate, it could endup being a decent place to live. To develop a model for how a star's magnetic activitychanges with time, Guinan and his colleague Scott Engle looked at the rotationrates of a large sample of red dwarfs. As expected, faster spinning stars hadmore X-ray and UV emission, as well as more flares.? The rotation causescharged material inside the star to be churned around, and this"dynamo" action generates a magnetic field. Gas around the starbecomes trapped in this field and heatedto millions of degrees. This hot gas produces the observed high energy radiation. By estimating the ages of stars in their sample, theresearchers were able to build up a typical red dwarf life history.? The data show that a red dwarf is born spinning rapidly, andit exhibits the corresponding magnetic activity. However, the magnetic fieldalso creates strong winds that carry away angular momentum, and thus slow thestar down with time. The conclusion is that a red dwarf will calm down afterabout 2 or 3 billion years. In comparison, our sun (a typical G star) wasmagnetically very active (with 2 to 5 big flares per day) for its first half abillion years. A planet with a substantial magnetic field, like Earth's,can deflect stellar winds and thereby avoid having its atmosphere stripped away. "This could protect the planet for the 2 to 3 billionyears that a red dwarf is active," Guinan says. He is not completely optimistic, however. The fact thatpotentially habitable planets around a red dwarf are tidally locked implies theyare rotating slowly around their axis. By the same physics that applies tostars, slow rotation will mean a weak magnetic field that could shut downcompletely. This is what happened to Mars. It had a magnetic field 3.5billion years ago, but when its liquid iron core solidified, the field turnedoff. Without this protective shield, the solar wind stripped away most of the planet?satmosphere and liquid water. To avoid this fate around a red dwarf, Guinan speculatesthat a planet might need to be more massive than Earth. The large liquid iron coreinside a super Earth (with a mass between 2 and 10 times Earth's) could perhapsmaintain a magnetic field in spite of the slower rotation rate. Interestingly, three of the two dozen planets detected sofar around red dwarfs are super Earths. More will presumably be found in futuresearches: ?The MEarth Project is a planned survey of 2000 M stars usingground-based telescopes, and the Kepler spacecraft that launched in March hasadded more red dwarfs to its target list. "M dwarf stars were overlooked in the past, but theyhave become more popular as people realize that life could potentially arisearound them," Guinan says.